In Gondar, in the Ethiopian highlands, smallholder farmers face serious challenges from climatic hazards, low agricultural productivity and harsh living conditions. Yet despite all of this, self reliance is still an attainable ambition in a country where, last year, 33 million people suffered from chronic hunger. Roots up is a non-profit which supports self-sufficient farming communities in the region by helping farmers implement simple, innovative, low-tech farming solutions that can reverse some of the damage done by incessant droughts and the use of expensive chemical fertilizers. Roots Up is currently crowdfunding a project to plant perennials, such as temperate fruit trees, which would help to reinvigorate the farmland and provide higher, more reliable incomes. 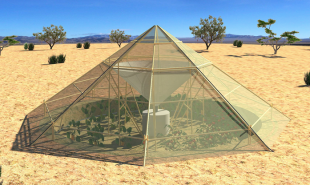 The non-profit also wants to help the farmers to build innovative greenhouses to collect water and grow vegetables, and implement low-cost Earth bag building which will provide sustainable homes — preferable to the expensive eucalyptus buildings which need regular repairs. Roots Up will be organizing workshops and training sessions in cooperation with the University of Gondar, teaching local farmers about innovative, sustainable farming options including permaculture, eco-building and natural energy. Roots Up is currently crowdfunding on Indiegogo.